Entertainment is a must have a thing in everyone’s life. With our lives becoming busy each and every day, we definitely need a proper source of entertainment to keep ourselves diverted from the tensions of work and personal life. Do you think getting proper entertainment right at the convenience of your own home is a tough task? Actually no, it is pretty simple and you can set up your own entertainment at your home and make your family time more entertaining and enjoying. Movie and cricket are the two things that Indians love the most. Who doesn’t love Bollywood dramas? If you are also one such a Bollywood movie lover, then having your very own home theatre must be your dreams of life for sure. But you must be stepping back considering the cost involved in setting up your personal home theatre. Don’t worry, Cyfrodom offers you highly affordable home theatre solutions where you can get your dream fulfilled in your budget. 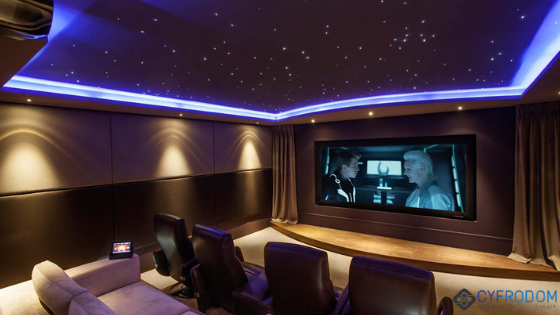 Cyfrodom even allows its customers to customize the home theatres according to their desire, choice, and taste. This allows the users to have an enhanced experience. Make your family time, get together with friends more entertaining by having a personal home theatre for yourself by availing the services of Cyfrodom.